The Umbrella Plant is a fast-growing shrub or tree that is native to Taiwan (Missouri Botanical Garden). It will happily grow in a variety of habitats. Grown outside, it can reach over ten meters in height. However, when grown indoors you can limit growth as you require. These plants make ideal houseplants as they are quite hardy and robust, and will thrive even when they are a little neglected. They only need a modest amount of water a few times a month, and so will survive perfectly well, even if you go on vacation for a few weeks and your plants are left without care. Overwatering is a more common problem than lack of watering with this plant, so be sure to only water them once the top layer of soil becomes dry to the touch. As well as being easy to care for, the Umbrella Plant makes an excellent house plant or office plant due to its air purifying qualities. 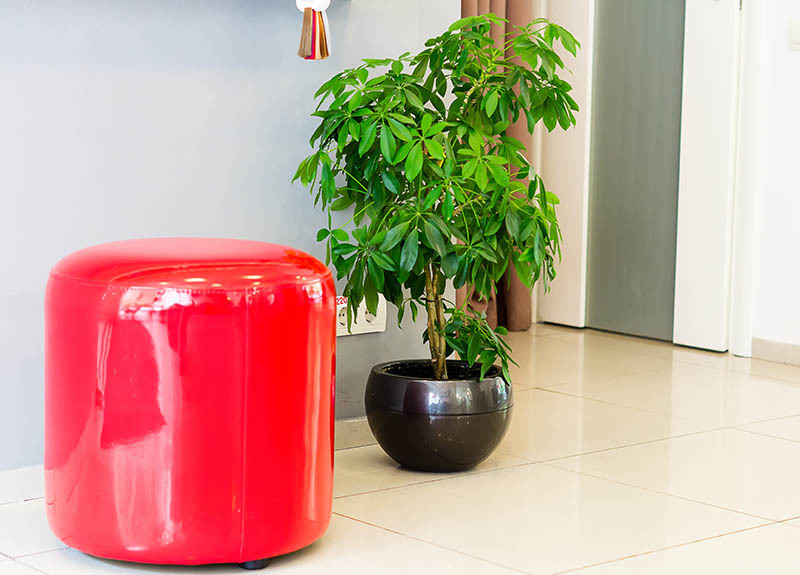 In addition to releasing oxygen into the atmosphere like other plants, the Umbrella Plant also absorbs toxins, thereby filtering the air in your property and leaving you with better air quality. The Umbrella Plant thrives in moist soil, though it tolerates a lack of moisture fairly well, and will generally recover easily if you forget to water it for several weeks. Overwatering is a more common problem with this plant, so be sure to only water it when the topsoil becomes dry. You will know if your Umbrella Plant has been overwatered if the leaves and stems turn brown or feel soft inside. Root rot could set in if the plant is overwatered; if this happens, you should remove all affected areas and put the plant in a new pot to help it recover. To avoid overwatering, keep the amount of water you use to a minimum, and also use a drip tray to collect any water and dispose of this regularly. The general rule is that larger Umbrella Plants will require more water to stay healthy, though they become inactive during colder months and so will need a smaller amount of water to maintain health. The Umbrella Plant is accepting of lots of conditions and will fare well in both bright and darker areas of homes. It will grow best in bright rooms, away from direct sunlight. If kept in these conditions, the plant should become bushy and tall. If kept in a darker room, it will continue to grow, though the leaves may be more spread out. A few hours each day of direct sunlight can be tolerated by the Umbrella Plant; however, too much sunlight will cause damage to the leaves. 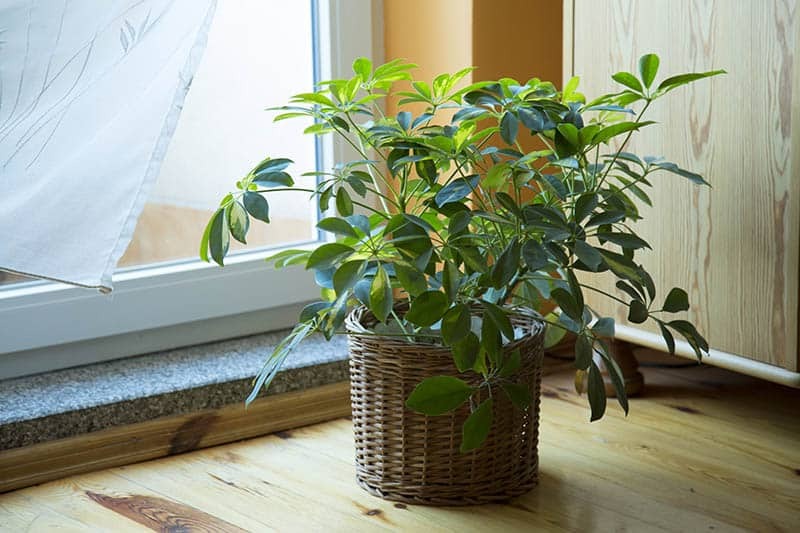 The Umbrella Plant itself fares well in normal humidity levels found in homes and offices (Iowa State University- Extension and Outreach- Horticulture and Home Pest News). However, insects love to make their home on the Umbrella Plant, and this is particularly a more prevalent problem in areas of low humidity. If you find that your plant is frequently suffering from an insect issue, you should try to raise the humidity levels. High humidity will not affect the plant’s health, but it will deter insects from setting in. This plant enjoys a range of normal indoor room temperatures, from 15°C / 59°F to 21°C / 70°F, though it will not tolerate temperatures lower than 13°C / 55°F or higher than 24°C / 75°F. Sudden temperature drops should be avoided as these will lead to the falling off of leaves, so do not keep the plant near draughty windows or doors. The green varieties of the Umbrella Plant tend to fare better at the lower end of the temperature scale, while the variegated variety enjoys it a few degrees warmer. 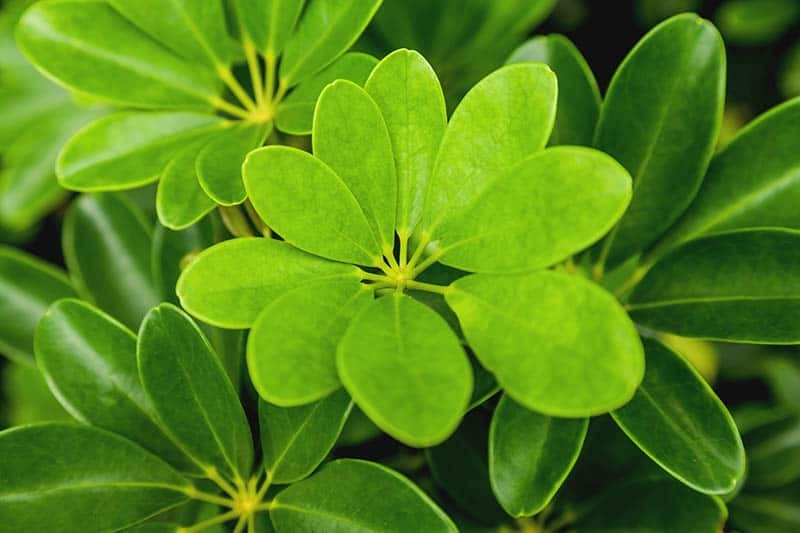 The Umbrella Plant requires a small amount of fertilizer to sustain maximum growth and health. A diluted general fertilizer used once a month will be adequate. The plant will not need feeding once it becomes inactive during winter or when it has reached the ideal size. To produce new Umbrella Plants from your existing plant, you will need to propagate it. These plants are renowned for being quite difficult to propagate, but it can be achieved with some close attention, determination, and practice. To do this, in the spring take cuttings of 2 to 6 inches in length. Trim off all but one set of leaves, and plant it in a similar soil to the parent’s plant, along with a rooting hormone, being careful to make sure the growing end of the stem is pointing upwards. Higher temperatures of up to 24°C / 75°F with a bottom heat source will likely result in more successful propagation. The biggest problem preventing propagation is overwatering, which very easily leads to root rot. Be very conservative with your watering until the cutting has plenty of new growth, at which point you can treat it more like a normal Umbrella Plant. This is a quick-growing plant that can easily get out of control if left to its own devices. The type of pruning you need to engage in will depend on your desired final look. For a shorter or bushier looking plant, pinch the tips growing upwards at the top of the plant. This will encourage growth lower down the stems and give a rounder appearance. For a more slender looking plant, allow it to grow without pruning, and it will naturally grow upwards in a tree-like form. If allowed to climb, the plant can reach heights of up to six feet indoors. 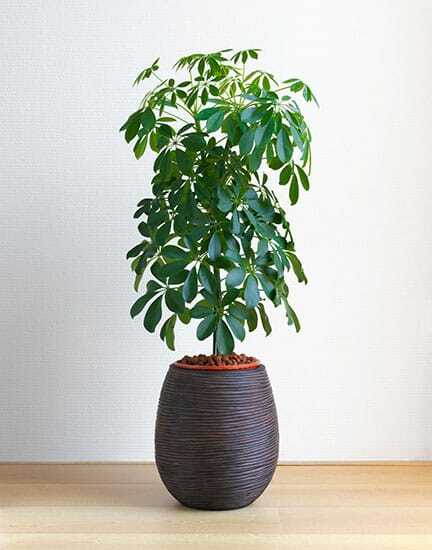 Even when pruned, the Umbrella Plant will not spread very wide, with a maximum diameter of around 75 cm / 18in. Due to its fast growth and robust nature, even if over-pruned this plant will recover very well with lots of new growth to replace the old cuttings. When grown outside in warmer climates, the Umbrella Plant produces vibrant flowers in shades of red. The flowers grow on long stems high above the leafy part of the plant. As houseplants, these do not produce flowers. 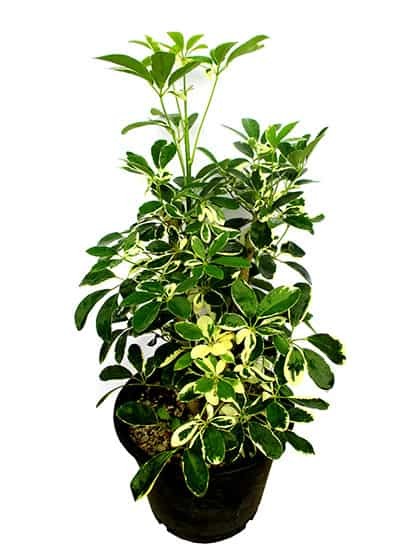 However, the Umbrella plant can produce some very interesting looking foliage, especially the variegated varieties which have various patterns of white and green on the leaves. The Umbrella Plant needs to be re-potted every two years once it has reached maturity to maintain good health. Re-pot the plant in new compost or standard potting soil, in a heavy, sturdy pot to help prevent taller plants from tumbling over. Try to re-pot in the springtime, and avoid feeding the plant for around four weeks after repotting as the nutrients in the fresh soil should be plenty to sustain growth. The Umbrella Plant does contain poison in the form of calcium oxalate crystals, which are found in the sap in the leaves and stems. Calcium oxalate crystals are tiny and sharp, and stab the skin or soft tissue that they come into contact with. The sensation of having calcium oxalate crystals in the mouth has been likened to biting into crushed glass. When ingested, this can lead to pain around the mouth, tongue, throat, and cause swelling, hoarseness, and even difficulty breathing (Children's Hospital of Philadelphia). Fortunately, large amounts of this poison are rarely swallowed because the pain felt around the mouth when biting into the plant prevents children or animals for going back for more. However, if ingested the calcium oxalate crystals can be fatal to dogs and cats. If you have children or pets that might nibble on your plants, it is best to keep them in areas out of access to prevent problems. You may also wish to wear gloves when handling your plant to prevent skin irritation. The common Umbrella Plant, scientifically named Schefflera, has a doppelganger named Heptapleurum. 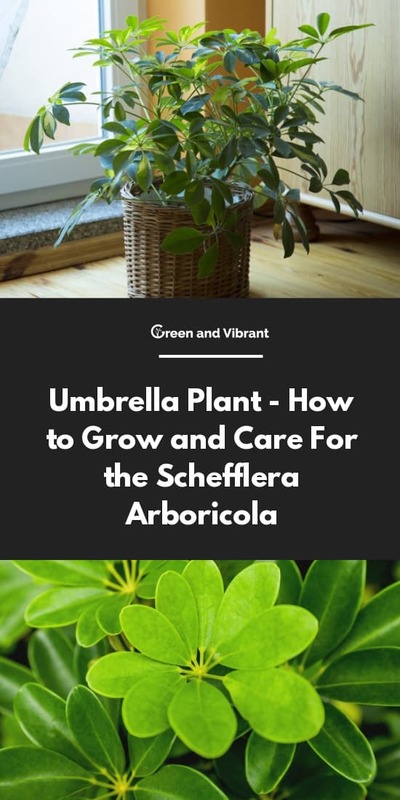 These plants are almost identical in terms of looks, and so are both referred to as Umbrella Plants, with the names Schefflera and Heptapleurum becoming almost interchangeable, though the true Umbrella Plant is the Schefflera, a relation of the Umbrella Tree. There are several varieties of Schefflera, with the three most common being green leafed, variegated, and dwarfed. The Umbrella Plant can also be grown as a bonsai tree with aerial roots. Umbrella Plants lose leaves naturally to make space for new growth; however, this loss usually happens near the base of the plant. If you find your plant losing its upper leaves, or that the leaves are turning a yellow color, then you likely have a problem. This issue is usually caused by a sudden drop in temperature, or if the plant has been roughly moved around. If neither of these things sounds like the culprit of your leaf loss, alternative issues may be over watering, under watering, or too much heat. Sad-looking leaves which droop or turn brown are generally a result of overwatering. You will know if this is the case by having a quick feel of the soil in your plant pot. The soil should be just damp, with a light feeling of moisture. If it feels wet or soggy, then it is getting too much water, and you need to adjust your watering levels. If root rot has set in, which commonly occurs with overwatering, you will need to remove all affected areas and re-pot the plant to encourage new growth and recovery. Due to the plants hardy nature, it should recover well from overwatering if the appropriate action is taken. Umbrella Plants become inactive during winter so do not produce new growth during this time. However, if your Umbrella Plant is struggling to grow outside of the inactive period, or its leaves look pale, then this is probably a result of a lack of nutrients. Make sure you are using fertilizer to feed the plant around once a month. The plant should recover in four to eight weeks. The Umbrella Plant commonly falls victim to spider mites, which hide on the underside of the leaves. They cause damage by making tiny holes in the leaves to feed, resulting in the leaves becoming pocked and discolored. If you suspect spider mites, check the underside of leaves for the spiders themselves or the webs they create. To deter spider mites, keep the environment in your home fairly humid, as the mites like dry air. The other pest commonly associated with Umbrella Plants are Scale Insects. These tiny insects can go unnoticed for great lengths of time. They hide well but leave behind sticky secretions that are clear at first, but later turn black. This residue, if left untreated, can spread to nearby household items and furniture, where it attracts mold and can cause serious problems. If a Scale insect infestation has taken over your Umbrella Plant, it is very difficult to get rid of. You can combat the problem with a number of steps, but disposing of the plant is often the best option. The Umbrella Plant, when grown outside, can reach surprising heights of over 40 feet. When kept inside, their maximum height is usually somewhere in the region of 8 feet, though this is still much taller than most people would like their house plant to be. This is where pruning comes in. By using a strategic pruning technique, you can encourage your Umbrella Plant to grow in the specific way that you would like. Pruning will also keep your plant healthy and help to elongate its lifespan. A good indication that your Umbrella Plant needs pruning is when the branches start to look long and spindly, with leaves only growing at the very ends. Sometimes the branches get so long that they start to collapse under their own weight. Too many branches or branches densely populated with leaves can also limit the light supply to your plant, as the leaves underneath may not be getting enough light to thrive. In this instance, the solution is simple. Take some cutting shears or some sharp scissors and simply chop the ends off the long branches, leaving around an inch of branch past where the last growing leaves are. This will encourage growth lower down the plant, resulting in a rounder look, as opposed to the straggly look your plant had before. Unhealthy looking stalks can be cut down to three or four inches in length. Don’t be worried that you’re going too far and reducing your plant to a few branches, because as you probably know by now, your Umbrella Plant will have re-growth very quickly and will soon need to be pruned again. If you are happy to have a long and tall Umbrella Plant with more of a tree-like look, then simply let it grow. It would be wise to frequently re-pot the plant in larger pots as it gains height to allow for more stability, as well as to freshen up the soil. If you have neglected pruning your Umbrella Plant and it has become wild and overgrown, you may be wondering where to begin with cutting it back and getting it into good shape. The best place to start is by thinning out the branches throughout the plant by cutting off stems and maintaining an even approach so as not to end up with a lopsided-looking plant. This will allow light to better penetrate the plant and will result in healthier and more even growth. If the main trunk of your Umbrella Plant struggles to grow any leaves, you should cut it back quite drastically. If you trim the main trunk back to around six inches in length, it will regenerate and quickly catch up to the longer lengths of any of the minor branches. If it is kept indoors, you can prune your Umbrella Plant any time of the year. Trim the plant regularly if you wish to create a more bushy effect or maintain a smaller size. 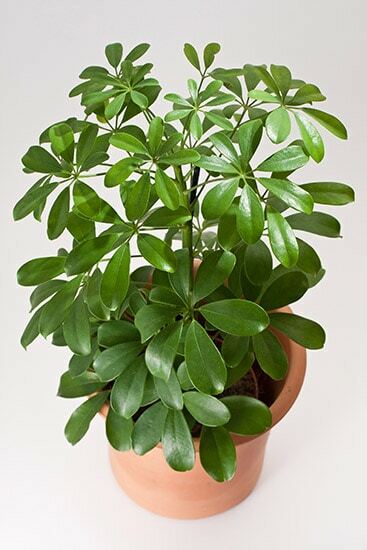 The Umbrella Tree Plant is not doubt a great houseplant that will make a nice addition and air purification to your house. If you don't know how to take care of this plant, I hope this article has shedded some great light. Let me know if you have any question about it.